We have many New and Wonderful stamp set with the Annual Catalog and up coming Holiday Catalog. It would be really easy to forget about the amazing stamps we already had… I don’t want them to get lonely. So make sure you get them inky from time to time! I decided to us my Watercolor Wings stamp set today. For this very reason. It had been a while sence the stamps has seen ink and they were feeling a little left out! That’s just no good. So, I gave them a little love with two challenges today. The SU!Only Challenge and The Fab. Friday Challenge. The Fab. Friday has a great sketch challenge going on right now! The SU!Only Challenge is featuring butterflies and dragonflies. How fun is that!! Earley in the week was the Inking Royalty Blog Hop. Lynn Kolcun featured a card that uses Stampin’ Up! ink refills on a gel plate to create a fun background. She had cased the technique from Lydia at Understand Blue. So, now I’m CASEing both of them. What fun!!! Watercolor Wings is one of those stamp sets that I just love! It makes it so easy to make pretty butterflies by layering the stamps! The butterflies in this set are gorgeous. The stamp I use the most is the little dots in a row! I love this set so much and those dots!!. The colors for the butterfly are Daffodil Delight, Powder Pink, and Calypso Coral. The envelope was given a little love as well. Using the small butterfly and the dots I love so much! Thanks for stoping by! I hope you will take time to stop by both challenge and check out the work of the design teams! Happy Saturday my friends! The Fab Friday group of Stampers are back with another great challenge for us. This challenge is a color challenge that uses Lost Lagoon, Blackberry Bliss, and Mossy Meadow. Now, if you read yesterday’s post you may be thinking that these colors are familiar. And, yes they are the colors in the Christmas Card from yesterday. But, that card had been designed several weeks ago. So I wanted to come up with a new card that was completely different for this Challenge. 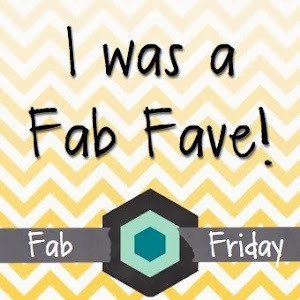 I wanted to challenge myself and play along with the talented design team over at Fab Friday. Check out all the great cards by the Fab Friday Design Team. So, today’s card is for a college roommate. Nan and I try to have dinner every so often. I have missed the last two secluded dinner meeting for one reason or the other. I decided that it was time to tell her hello and that I am so sorry for bailing out! I hope we get to catch up soon and that she know I miss her. Along with my other roommate. I need to make them a card also. We all have such busy lives it is hard to keep in touch. I note is a great little way to say, “I’m thinking of you” or “I miss you”. Friends are so important in life. It’s nice to know that we can still connect with long time friends. Here is my Card: This card is a clean and simple one layer card. That really depends on a great color scheme to bring the card together. I Love the simple scripted hello. It is from the new Greetings thinlits. In the greetings thinlits you get three scriped words hello, thanks, and cheers. You may recognize the dot’s from Tuesday’s post. They are the dots from Watercolor Wings. I told you that I love dot’s and that you would be seeing more of them…..I’m sure this still holds true….More dot’s are yet to come. My card base is from the note card and envelope pack. I truly like this size of card. Using Mossy Meadow card stock cut out the hello thinlit with the Big Shot machine. A little tip…When using thinlits and detail dies if you put a piece of parchment paper between the card stock and the die . The card stock will come apart from the die much easier. Adhere the hello to the card base. I did this using a sticker maker by xyron. (not a Stampin’ Up! product but, still great) Maybe, one day they will start carrying this great product. it is perfect for small die cuts such as this hello. That’s it. So simple and clean. Now if you really want to make your card stand out. Remember to decorate your envelope. I went slightly over board with my envelope decorating. I like it though. And my friend Nan will know that I miss seeing her.